Enthusiasts glimpsing a rare sighting of those shy woodland creatures Accrington Stanley in the spring of 2009 may have been wondering at their strange migratory patterns, and what form their next musical gesture to the outside world would take. Originally a reaction to a spell of gig-free downtime, but mostly driven by a need to take a fresh approach to songwriting, the band started posting demos to each other: eventually meeting up to layer their respective loops, drumbeats, samples together and begin constructing songs out of the pieces. 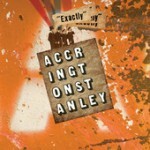 “Exactly“, the fruit of their labours, shows the diverse origins of these collaborations; laptop doodles pieced together on train journeys, some single-take jams among the toys in the kids’ playroom; finished songs from the prolific O’Farrell demo factory; found cartoon sounds, sampled feedback and nocturnal musique-concrete experimentation woven into the album’s melodic fabric. The only constant – a “studio” in the shape of a trusty laptop, burned to a crisp following the final mix. Listen and find out why. The first single taken from the long-awaited new Accrington Stanley album (expected Autumn 2012), “Rites of Spring” is already a live favourite and evidence of a change of gear for the band, both songwriting and arrangement-wise. As the band explained recently to Xan Phillips (103.9 Voice FM), the new songs were inspired by drum loops created when drummer Alex Bridge moved to Wales for a spell. bolstered by some sampling experiments and using the bare minimum of studio gear, “What started out as a bit of a weekly laptop experiment at guitarist Rufus Grig’s house…turned into some of the best recordings we’ve ever made”. The EP also contains another regular live track Beer & Self-Loathing, as well as the first official release for some classic Stanley tracks revisited in a quick set of recorded-almost-live studio dates in Winchester. 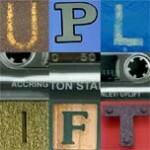 Marking a return of the Stanleys following the move out of London, Uplift sees the mighty set of 1998-2004 songs in recorded form. As well as classic rockers ‘Couples’ and “Laughter”, we’re treated to the classic Stanley sound of “The Open Road” and the quirky arrangement of ‘Memory Purge’. Recorded at Rob Sansome’s marvellous Factory Road Studios in autumn of 2004 and released early the following year. Originally intended as a dashed-off weekend recording demos, this turned into a bold declaration that the band were still very much in business following turbulent times in London. The band used up the last of their money making the journey out to the suburbs of Middlesex to finish off the recording; and the album only enjoyed a semi-official release until the revived band fired up their engines again in 2002. But this set remains a favourite among Stanley afficionados for the diversity previously heard in the fledgling “Fathom” era. Certainly the breathless punk salvo of “Walls”, the subversive sentimentalism of “Follow your Heart”, the dark humour of “the Thin Line” and the Southampton club scene-namechecking “Tentacles” proves a heady brew. For many, the classic sound of Accrington Stanley, bringing together the best songs from the formative period in Southampton and toured around the UK university circuit from 1989-1992. 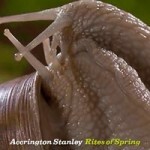 Having made some trial runs recording individual tracks at various London studios, and emboldened by the club and stadium dates in Japan in the Winter of 1992, the Stanleys ventured up the Bakerloo Line under the watchful exec producer’s eye of Steve Hepworth to make their definitive statement of what Accrington Stanley was all about.